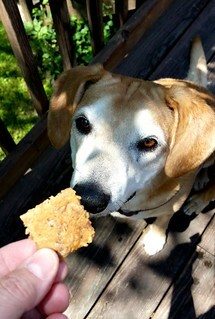 Disclosure: Hungry Hound Beerscuits sent 2 bags of dog treats to Lapdog Creations, free of charge for review purposes. I was not compensated for this review and all opinions expressed are my own. Reduce, Reuse, Recycle... we hear those words uttered all the time, and if you're like me, you try your best to do so. Perhaps by growing your own tomatoes or by shopping at the local farmers market. Or, upcycling that old door into a dining room table. Maybe even repurposing an old dresser into a shabby chic TV stand. Okay, maybe I've been watching too many Flea Market Flip reruns lately, and am getting overly ambitious in my recycling. Let's bring this post back to being dog related (of course you could repurpose that old dresser into a really funky dog bed...). I'm sure 90% of dog parents recycle those plastic grocery bags that pile up, but have you ever thought about upcycled dog treats? Or, more specifically, dog treats made from recycled brewers grain? The key ingredient in Hungry Hound Beerscuits is recycled barley brewers grain - but don't worry, these delicious biscuits won't get your dog drunk. They just might get them buzzing with joy, however. So... now you can crack open a cold one on Saturday afternoon and tell the world you're helping to recycle! 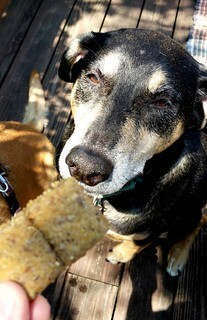 You're probably thinking... who thought about recycling brewery grains to make dog biscuits - and why? 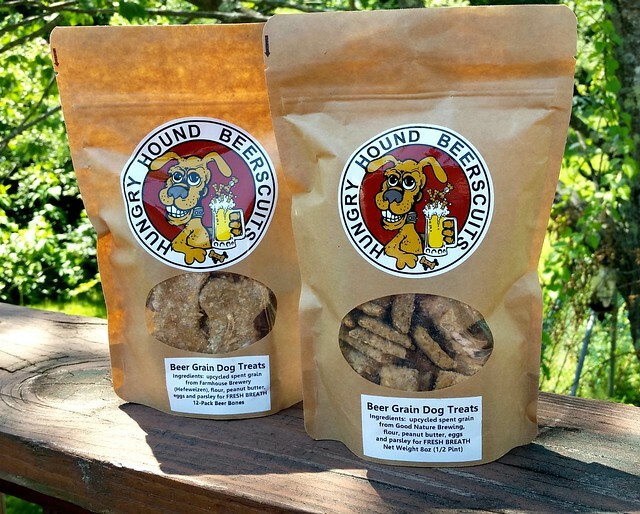 It all began when the creators of Hungry Hound Beerscuits, who's motto is "Keep it Local, Keep it Fresh!," started making treats for their dogs as a way to upcycle the grains from their own home brews. Their dogs went so crazy for them, that they decided to share the treats with friends and family.... and all the dogs went bonkers wanting more! After deciding it would be selfish to keep these yummy beer biscuits all for their own special pooches, they set out to create Hungry Hound Beerscuits. Having raised a booze hound myself, I can attest to the truth in that quote! I only wish my Zeus were here now to enjoy these treats. My boy would have sang out loud for these biscuits! Hungry Hound Beerscuits are crafted by hand, in small batches and made with lots of love in Conklin, NY and Montrose, PA. They use simple ingredients like fresh brewers grain, local eggs, peanut butter and parsley. 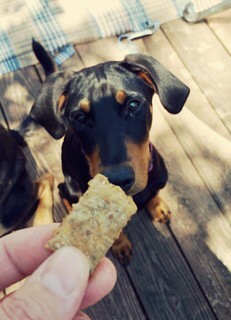 Hungry Hound Beerscuits do not contain soy, hops or preservatives. The company currently upcycles their grains from eight different local-to-them breweries, all of whom are listed on their website. The ingredient label on each bag also tells you exactly where the recycled grains came from, which I love. Not only is it cool to know where the grains in your dogs' treats came from, there's no guesswork in wondering what inside a bag of Hungry Hound Beerscuits. Hungry Hound Beerscuits are proud to be a part of the Pride of NY and Taste NY programs. Additionally, they support dog rescue by donating a portion of their proceeds to a different organization each month. A cause near and dear to my own heart + craft beer related + helping the environment + the Lapdogs love them = What could be better?! 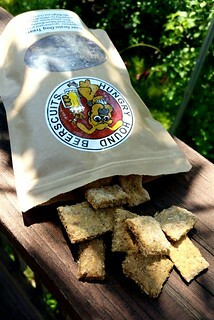 We are certainly big fans of Hungry Hound Beerscuits and are sure you will be as well! You can order direct from their website, plus find out the latest happenings (and see lots of cute doggy pics) over on their Facebook and Instagram pages. If you're in the NY/PA area, make sure you check out their events page as well! My dog Libby loved beer and would steal one if someone put theirs down. I'm a little concerned about peanut butter treats now that some companies are using Xylitol as a sweetener. We pick our ingredients very carefully and ensure you that we do not use peanut butter with Xylitol as an ingredient!